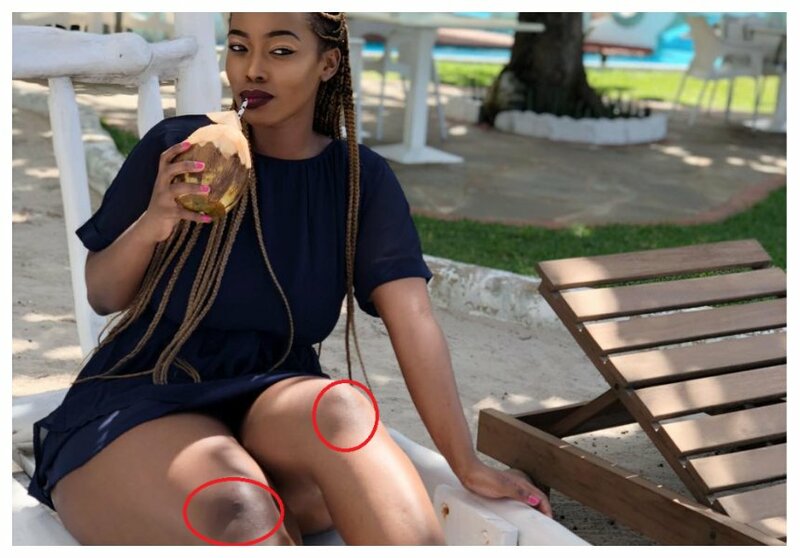 Bootyful socialite Corazon Kwamboka has an uneven skin tone, she is light on most of her body but surprisingly her knees are dark. The oddity on Corazon’s body was noticed by netizens who had been keeping an eagle eye on her during her vacation to the Coast. Most people quickly concluded that Corazon’s uneven skin tone is as a result of bleaching, but the bootyful socialite has a rather interesting explanation. Corazon refutes claims that she bleached her body, she explains that the dark patches on her knees are as a result of punishment she was subjected to while she was still a pupil at a village school. The socialite says that teachers used to make her kneel on the gravel for hours as punishment for being naughty. The punishment is what caused her knees to be darker than the rest of her body. “Every time I post a pic one beautiful girl or boy usually end up talking about my dark knees, I’ll tell you why? It’s not coz I bleached; never have never will, it’s coz in my village primary school they used to make naughty pupils kneel on hot gravel for hours as punishment; and I was very naughty, so once a week I would end up on hot Kokoto for one reason or the other. So stop mentioning it all the time, coz that reminds me of the traumatic experience I had , just kidding.. you can go ahead and make fun of them, I don’t care. You all know how thick my skin is that’s why you guys like bullying me. Ps; today I weigh 86.5kgs… the journey to 77kgs continues,” wrote Corazon Kwamboka.